Discover ice cubes, ice floes, and igloos with the great early science, outdoor, and culinary activities in this theme. 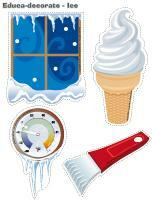 (Open thematic poster-Ice) Print, laminate, and decorate the walls of your daycare with all kinds of posters. (Open educa-decorate-Ice) Print, cut out, and laminate. 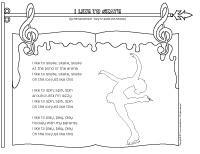 Use the illustrations to decorate the walls of your daycare or hang them from the ceiling for the duration of the theme. Transform your daycare simply by depositing white blankets or cotton batting on the floor. Children can sit on them, pretending they are on ice. This special tool was created in response to a special request received. (Open motivation chart-Hand washing) Each time children wash their hands, let them stick an illustration on their chart. Collect pictures or figurines which represent the Arctic. Deposit all the items in the centre of your circle. Select one item at a time and invite children to tell you everything they know about it. You may also use a book to talk about the animals which live in the Arctic permanently and those who migrate to the Arctic. Can you name sports which are practiced on ice? Do you know how ice is made? What color is ice? What looks like ice? At home, where can you find ice? How can it be used? The pictures may be used as a memory game or to spark a conversation with your group. Use them to decorate your daycare or a thematic corner. 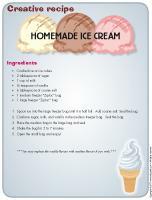 (Open picture game-Ice) Print, laminate, and store the cards in a Ziploc bag or in your thematic bin. 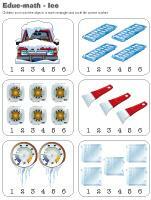 (Open writing activities-I like ice) Print for each child or laminate for use with a dry-erase marker. Use the stationery to communicate with parents, in your writing area, or to identify your thematic bins. 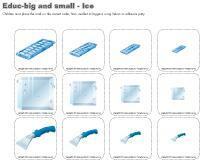 (Open stationery-Ice) Print. (Open observation sheet-Number 7) Print for each child or laminate for use with a dry-erase marker. (Open educa-nuudles-Ice) Print for each child. Encourage children to color the page and use Magic Nuudles to give it a three dimensional look. Variation: You don't have Magic Nuudles? 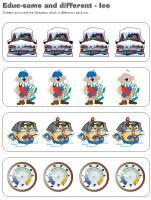 Have children fill the spaces designed for Magic Nuudles with bingo markers or stickers. 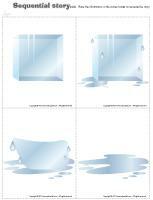 (Open sequential story-Ice) Print and laminate the illustrations. Let children manipulate them. Encourage them to place them in the correct order. Have fun with these wonderful workshops created by Caroline Allard. Provide only white, blue, and gray building blocks (if you have enough). Use a roll of cotton batting to create a carpet of snow. Children will love building in the "snow". Sort your animal figurines and keep only the ones which can be seen in wintertime. Add a container filled with salt (or sugar) to your area. Let children play in it with small toy cars or figurines. Offer figurines which can become skiers or snowboarders. Decorate your area with pictures of snowmobiles, skiers, igloos, etc. A large quantity of glitter and glitter glue. 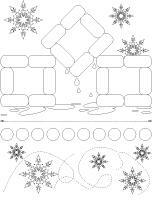 Coloring pages related to winter. Construction paper, tissue paper, and other kinds of paper in every shade of blue, white, and gray. Salt which can be used to draw on dark-coloured paper. Chalk for drawing on dark-coloured paper. Cotton balls which may be glued on drawings. A model which can be used to make paper snowflakes. Snowflakes made with white glue and waxed paper. Simply draw the snowflake outline with the glue, let dry, and remove gently... the result is spectacular! Painting with colourful ice cubes. Winter clothing of all kinds: mismatched mittens, wool socks, etc. A large pot that children can use to pretend they are making soup and bowls to serve it in. Decorate your area with winter scenes. You can even make fake windows and glue them over winter scenes. Use cardboard to make a fireplace and add a few logs. 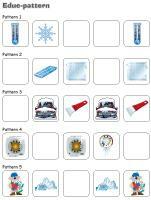 A memory game with a winter theme using educatall.com illustrations. White, blue, and gray modeling dough. Add glitter to make it extra special! Association game about winter sports (example: a picture of a skate and a picture of child skating). Sugar cubes which can be used to build igloos. Miniature marshmallows can be used to build snow banks. Stimulation bottles filled with wintery items. Books about winter filled with beautiful illustrations. A photo album filled with pictures of children playing in the snow. Blue and white Christmas lights to create a magical corner. Salt or sugar bin: Hide objects in the salt/sugar or add pinecones, pine branches, etc. You can also hide white objects in the bin. Children will love the challenge of searching for them. A container filled with snow. Children can wear mittens or gloves to manipulate its content. Ice bin: When it is cold enough, simply leave a container filled with water outside overnight. Children will enjoy making figurines skate on the ice. Whipped cream bin: The contents of this manipulation bin may be eaten. Powdered potatoes bin: Children will love playing with this texture! Let children taste a variety of white food items: sugar, salt, icing sugar, flour, etc. Bake a cake and let children help you top it with vanilla icing. Prepare whipped cream with your group. Color combinations... what happens if you add white to a color? Hang a wintery mobile above your changing table. Children will admire it during diaper changes. Freeze yogurt tubes. Let children manipulate them without opening them. They will explore the cold sensation. If you prefer, you could also freeze small amounts of water in Ziploc bags. Deposit a large block of ice (for coolers) in a container. Invite children to play on the ice with figurines. Show children how ice melts quickly and becomes water. Fill transparent bottles with water, glitter, and tiny wintery objects. Seal the bottles with hot glue and deposit them in the freezer. Once the contents of the bottles are frozen, let babies manipulate them. 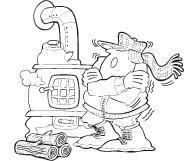 Greeting: Wear a tuque, a scarf, and mittens to greet children in the morning. Circle time: Have children manipulate two "ice packs", one hot and one cold, during circle time so they can understand the difference between the two temperatures. Lunch and snack: Ice cream, frozen yogurt, frozen bananas, frozen grapes, popsicles, etc. can be served as a snack. For lunch, serve a cold meal or a comforting meal which feels good on cold, winter days such as chicken noodle soup or vegetable soup. Special activities: Why not spend the day outside? Follow the tracks children make in the snow, build an igloo, make a snowman, try snowshoeing, etc. Indoors, you can use sugar cubes or marshmallows to make various sculptures or paint with white poster paint on black or dark blue paper. Offer a container filled with snow and mittens too! (Open hockey game) Print and assemble the various pieces and hang the net on a wall. Children must, like in pin the tail on the donkey, stick the puck as close to the centre of the net as possible. (Open lacing-penguin) Print, laminate, and punch holes all the way around the penguin shape. Children can use a shoe lace, string, or ribbon to lace the penguin. Drape a white sheet over a table to create an igloo for your group. Add a container filled with snow or ice and figurines. You may also include books about polar animals. Children will love playing under the table, in their igloo. Create an obstacle course in your daycare. Use cones and other obstacles children must go around. Offer felt soles (used for shoes and boots), wool socks, or empty tissue boxes. Children use them to skate throughout the obstacle course. Play music as they skate! Wet towels and facecloths and hang them outside for a few hours on a very cold day. They will harden somewhat, but it will be possible to bend and fold them. Children can use them to make a variety of sculptures. (Open models-Fish) Print. Have children color the fish. When they are done, laminate them and cut them out. Add a paperclip to the back of each fish. Tie a string to the end of a broomstick or branch and tie a magnet to the other end of the string. Children stand behind a couch and go "fishing". This activity can also be done outdoors. Simply hide behind a snow bank and attach the fish to the end of the fishing line. Fill a platter with ice cubes. Divide your group into small teams. Each team must try to build the highest tower possible using ice cubes. This activity can be repeated... until the ice cubes melt away! Prepare a large quantity of colourful ice cubes with your group. Hide them outside. Children will love searching for them. If your group is old enough, you may ask them to search for a specific color. Fill several margarine tubs with colourful water (spray them with cooking spray first). Leave them outside overnight. The next day, children can use the ice blocks to build colourful castles. Fill a few spray bottles with colourful water and let children use them to paint on snow. The water will freeze and the colourful plaques will turn into ice. ***To ensure the "paint" is washable, use the tips of washable Crayola markers. Dip them in the water for a few minutes. You can use old markers. Even when markers stop writing properly, there is enough ink left in them to make the water colourful! Use pliers to remove the tips of the markers. Use your sidewalk chalk to draw on ice patches (or hardened snow) in your backyard. The results are quite impressive! (Open educ-math-ice) Print and laminate for durable, eco-friendly use. Children must count the objects in each rectangle and circle the correct number. (Open educ-same and different-Ice) Print and laminate for durable, eco-friendly use. Children must circle the illustration which is different in each row. (Open educ-big and small-Ice) Print and laminate. Children must place the cards in the correct order, from smallest to biggest, using Velcro or adhesive putty. (Open educ-pattern-Ice) Print and laminate. Children must correctly place the cards to complete the patterns. (Open hunt and seek-Ice) Print and laminate. Children search for the items in the picture. 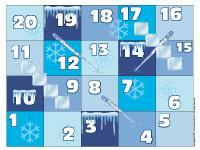 (Open snakes and ladders-Ice) Print and laminate. Use a die and figurines as game pieces. The object of the game: children must all reach the final square. Purchase two ice cube bags (used for camping) and empty them in a sensory bin. Add penguin and polar animal figurines and let children explore the cold ice. Fill your sensory bin with water and leave it outside overnight. The next day, children will love making figurines skate on their very own rink. Use three pipe cleaners to make a ball or a cube and fasten the ends together. Dip the ball or cube in water and hang it outside. Study the formation of ice crystals with a magnifying glass. Fill a variety of plastic containers with water. Hide different objects inside and deposit them in the freezer or outside until they are completely frozen. Remove the ice blocks from the containers and place them in a tray on a table. Invite children to guess what is hiding in each block of ice. Watch the blocks of ice melt away and verify children's hypotheses. They will love discovering the treasures! Globule wonders... how many different forms of water are there? Ask the children the following questions: How many forms of water can we observe? What is ice? How does water turn into ice? Can you name the other forms of water (snow, vapour)? Your early childhood educator will give you a small plate with an ice cube in it. Hold the ice cube in your hands. What do you notice? Why is the ice cube melting? ***Encourage children to realize that the warmth of their hands is melting the ice. Try to catch the water in your plate. How could we turn the water into ice again? Fill the plastic container with water and place it in the freezer. You will have to wait several hours before seeing the result. The frozen water will have taken the shape of the container. Now that you have seen both the solid (ice) and liquid (water) states, do you think water can have other forms? Your early childhood educator must do the manipulation for the next step of the experiment. She will pour 1 or 2 cups of water into the kettle and bring it to a boil. ***Do not come near the kettle, it's very hot! What is happening? What is coming out of the kettle? Can you name this other form of water? It is steam/vapour. Let the water boil until there is no longer any steam/vapour coming out of the kettle. The kettle is now empty. Where did all the water go? All substances belong to one of three categories: solid, liquid, or gas (vapour). Substances can change. You observed this during your experiment. For a substance to change category, the temperature of the substance must vary. Water (liquid) at room temperature became ice (solid) when it became cold in the freezer. Water (liquid) at room temperature was heated and became vapour (gas). The vapour dissipated in the air. You can easily observe rain changing to snow outside. Snowflakes are miniscule ice crystals, the solid state of water. Globule wonders... How can we catch an ice cube in water using only a piece of string? Spark children's interest with a magic trick. Ask them how they could catch an ice cube which is floating in water without using their fingers. The only tool they have is a piece of string. Let them come up with several possible solutions they can try. Your early childhood educator will give you a glass of water and a piece of string. Place them in front of you. When everyone is ready, your early childhood educator will deposit an ice cube in your glass. Using ONLY the string, try to catch your ice cube and take it out of the glass. CAREFUL! You mustn't touch the ice cube with your fingers. **If children spend a great deal of time attempting to catch their ice cube, be sure to have other ice cubes on hand. Difficult isn't it? Now, your early childhood educator will give you magic powder. Deposit one end of your string on the ice cube and hold the other end in your hand. Sprinkle a small quantity of magic powder on the ice cube. Stay still for 15-20 seconds then pull on your string. The ice cube clings to the string like magic! Ask children, "What do you think happened? What do you think the magic powder was?" Let children think about it and state their ideas. When they are done, tell them it was just table salt. Salt has special properties. These properties make ice melt. This is why we put salt in our driveways and on roads in winter. Salt is very useful. It prevents many injuries related to slipping on ice and considerably reduces the number of car accidents. In your experiment you used only a pinch of salt. It was not enough to melt the entire ice cube. However, it was sufficient to melt a tiny portion of it which was enough for the string to penetrate the ice. The temperature of the water cooled the portion of the ice cube which had melted upon contact with the salt. The ice cube hardened once again, trapping the string inside. With your group, melt marshmallows in a microwaveable bowl for approximately 30 seconds. Give each child a chance to stir. Return the bowl to the microwave for 10 more seconds. Deposit the melted marshmallows in the centre of the table. Children will have fun creating an igloo simply by sticking the melted marshmallows together. Deposit small fruit pieces in the compartments of an ice cube tray. Fill them with water or fruit juice and deposit the tray in the freezer. Prepare fruit punch by simply combining different fruit juices (pineapple, orange, grapefruit, etc.) Add your special ice cubes and let children discover the fruit pieces. Show children how to make their own slush simply by combining crushed ice and juice. Provide spoons so they can stir their slush themselves. Spoon ice into the large freezer bag until it is half full. Add coarse salt. Seal the bag. Combine sugar, milk, and vanilla in the medium freezer bag. Seal the bag. Place the medium bag in the large bag and seal. Shake the bag for 5 to 7 minutes. Open the small bag and enjoy! **You may replace the vanilla flavour with another flavour if you wish. Fill an ice cube tray with water, adding food coloring to each compartment. Insert a Popsicle stick in each compartment just as the mixture is beginning to freeze. Give each child a large piece of heavy paper. Let them paint with these very special paintbrushes. Give each child a small aluminum pie plate. Have them add glitter, metallic confetti, small seasonal objects, etc. to their plate. Fill all the plates with water and add a piece of ribbon or string, letting it hang over the edge of the plate so you can hang your suncatcher once it is frozen. Deposit everything in the freezer (or outdoors). Once the suncatchers are completely frozen, remove them from the pie plates and hang them in a tree on a very cold day. Children will be very proud of their temporary decorations. 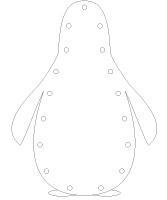 (Open models-Penguins) Print and decorate the penguins using glitter, lace, ribbon, cotton balls, confetti, etc. Glue the penguins on either side of ribbon or string. Hang your mobile from the ceiling. Provide uncooked spaghetti and miniature marshmallows. Encourage children to create all kinds of sculptures. When they are done, display their masterpieces, just like in a museum. Provide a good quantity of modeling dough. Let children create various sculptures together. Prepare a good quantity of salt dough. Let children create various sculptures together. Deposit a large block of ice (used in coolers) in a big container. Invite children to scrape the ice block with a spoon to sculpt it. Let children play in a container filled with blue Jell-O using their hands. Add Jell-O cubes which can be used to make sculptures. Purchase a block of clay and let children create an original sculpture. Let dry as per the instructions on the package before painting. Using recycled materials (metal cans, yogurt containers, empty toilet paper rolls, bread ties, etc. ), ask children to create a sculpture. Use hot glue to help them hold everything together. This may be a collective or individual project. Display children's work. 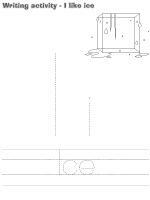 (Open coloring pages theme-Ice) Print for each child. 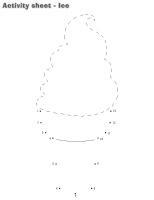 (Open creative coloring-Ice) Print for each child. Invite children to complete the outdoor skating rink.